Horncliffe Bridge over the River Tweed in the Scottish Borders. Designer/Engineer: Sir Samuel Brown, Captain in the Royal Navy. Traffic: Motor vehicles & pedestrian. Length: 420 ft. Width: Single track. 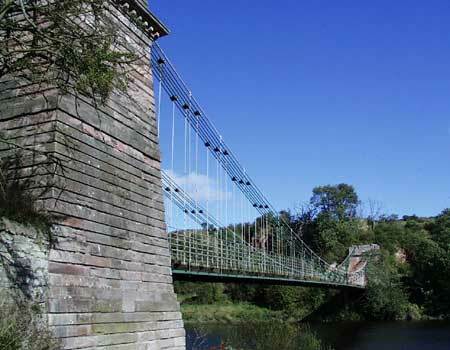 Horncliffe is a quiet village on a bluff above the wooded banks of the River Tweed with a surprising and beautiful bridge for the least used of the four roads crossing the river into Scotland. This was the first suspension bridge to be built in Britain (1820).